The following is a brief overview of the events. A more comprehensive version of the original story can be read here. The version on the left reflects the eyewitness testimonies and how this story is typically told. The version on the right explains briefly what actually happened, all of which is dealt with in more detail later in this document. 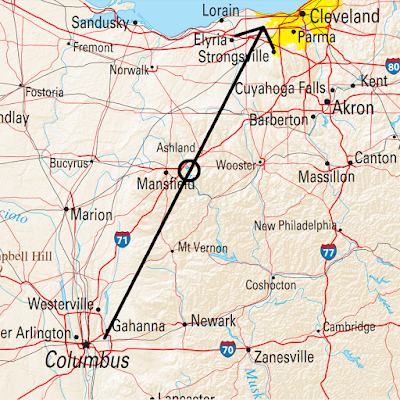 The following events took place on October 18, 1973, at approximately 11pm, when an Army Reserve helicopter with a crew of four (namely Coyne, Jezzi, Healey and Yanacsek) were flying from Columbus to Cleveland, cruising at 90 knots at 2,500 feet, close to the midpoint of their trip near Mansfield, Ohio. Healey saw a single red light on to the west, heading south, which seemed brighter than a typical left side navigation light of a plane. It wasn't relevant traffic, so he didn't mention it, but after an estimated 3-4 minutes Yanacsek saw it on the other side of the plane, now traveling north. It appeared to be pacing the helicopter. After a minute, he reported about it to Coyne, and after further 30 seconds he announced it's closing on their helicopter. The red light seemed to become brighter and to be on a collision course, coming from the right, with estimated speed of over 600 knots. Coyne began to descend to avoid a collision, which increased his airspeed from their 90 knot cruising speed to 100 knots. Instead of colliding, the light began to hover above the helicopter for a brief while, and the crew saw a big cigar-shaped gray metallic object, which had a red light at its nose and green at the back. Ground witnesses similarly saw a red light being followed by a green one, coming from the east, and eventually hovering on top of the helicopter. Coyne draw a picture of it, that showed a dome on top of a cigar shaped flying saucer type of thing. Suddenly a powerful green light began to swung up over the helicopter nose, through the windshield, bathing the cockpit in green light. Ground witnesses also reported how the light painted the helicopter and ground below in green. After some seconds, the light turned off and the object began accelerating to the west, showing only a white "tail" light. Most of them estimated it gained a speed of several hundred knots and watched how it took a 45 degree turn right close to Mansfield as it was disappearing to the horizon. The helicopter crew hadn't followed their altimeter for several minutes, being in a state of panic and concentrating on the events around them. Then they noticed their altimeter showed they had clibmed from their last known altitude of 1700 feet to 3500 feet with a rate of 1000 feet/min. They believed the object had pulled them up. Coyne tried to descend but the helicopter still kept ascending for another 300 feet, after which they felt a bump and apparent turbulence. As the turbulence began to ease, they finally managed to lower the helicopter back to its normal 2500 feet cruising altitude. Later the frightened crew reported the incident and gave interviews, leading to one of the best, "most credible" and "mind-boggling" UFO cases in history. Healey saw the left side navigation light of an aerial refueling aircraft that was going south. The plane began a 180+ degree turn to the left, which took it to the other side of the helicopter in a couple of minutes. It began adjusting its direction, speed and altitude for the expected refueling of the helicopter. The plane flew almost as slow as the helicopter, almost to the same direction, descending closer to refueling position. Anxious and lacking visual reference points, the crew misjudged the trajectory and speed of the plane. The helicopter seemed to began descending according to usual refueling protocols for increasing and hence better matching the speed of the tanker plane with a minimum refueling speed of ~100 knots. One can't "hover" over a helicopter that is flying at 100 knots! The tanker reached the refueling position and matched the speed of the helicopter on top and somewhat in front of it. Since the witnesses mistook the relative sideways movement as the real one, they thought the left navigation light was in the front and right on the back, and saw the wings as the fuselage and possibly the actual fuselage or some other part as a dome from that upwards angle. The anti-collision lights were off. The tanker crew noticed something is not right, such as the helicopter missing the necessary refueling probe, or didn't behave as it should at that stage. They turned on their white searchlight to see what's underneath, painting the insides of the helicopter green due to it's green-tinted upper windshield panels. Ground witnesses saw the green insides and light against the green forest background, getting an impression of a green light, whose actual source was behind the helicopter. Realizing their mistake, the tanker crew turned off the searchlight, left with the actual tail light or a refueling pod light on, and began to increase their speed and altitude. They began to turn somewhat towards the west but were actually still flying mostly towards the north, which the helicopter crew once again misjudged due to their relative movement, change of altitude, and the parallax effect. The tanker plane caused wingtip vortices behind it but initially the helicopter was close and low enough not to be affected. While it moved towards the left and further away those reached the helicopter, causing upwards airflow. Coyne might have also touched the controls in his state of confusion, so that the resulting climb could be a combination of both of those reasons. Eventually they hit turbulent air, as they didn't understand the situation and didn't know there are vortices to avoid. After almost 45 years, so ends the story where the "aliens" were the ones expecting the other party to have a probe. There is one incident from this wave that still has the most rigid of skeptics scratching their heads: The Coyne Incident. You have four military members who had a close encounter with this object, and these are four very credible witnesses. Who remembers the 1973 case where a UFO nearly destroyed a US Army Reserve helicopter? You should. Even the debunkers and sceptics get uncomfortable with this one. For some convincingly documented cases which have stubbornly withstood the assaults of pelicanists, see The UFO Encyclopedia, 2nd Ed. Perhaps the most reliable UFO case of all time occurred during October 1973 – “The Coyne Incident”. Without question, “The Coyne Incident” is one of the most credible and mind-boggling cases in UFO history. The Coyne incident alone is worthy of mainstream attention and respect from both science and media. Arguably the Coyne incident is the UFO case that could help win US government disclosure. In the end, this is a case that screams to be labeled as "unidentified", because there is no valid explanation for it. There is no easy solution here, and sometimes that is about all that can be said about a case. the Coyne case is the very definition of an "unidentified." Of all the cases examined in this chapter, the Coyne case is the best. The witnesses were well trained, they had an opportunity for a detailed observation, and there were other witnesses to the event. There simply is not terrestrial explanation for this case. Was this a misperception or a hoax? Military officers and flight crew who want to keep their jobs do not report hoaxes. The independent ground witnesses and the flight report filed by Lieutenant Coyne agree about the details of the encounter. All four helicopter witnesses agree both about what they saw and about their maneuvers before and after the encounter. There was a physical effect: the helicopter's magnetic compass failed immediately after the encounter and had to be replaced. Was the UFO a secret military or civil aircraft? Only if the United States or a foreign power was testing a secret aircraft over Ohio in the middle of the night and while doing so, dangerously interfering with a routine military helicopter flight. It was seen at close range and was not recognized by any of the witnesses as a military or civil aircraft. Its performance was extraordinary. Forty years later, no existing aircraft can do what that UFO did. As Hynek established a nation-wide UFO reporting system for CUFOS, the young organization got its first important case: the Coyne event in October 1973. This spectacular encounter, in which a military helicopter nearly crashed after a close call with a cigar-shaped object, became the gold standard for UFO cases, and helped to established CUFOS' stature in the field of ufology. Notably, the case attracted the attention of Hynek's old friend and colleague Jennie Zeidman (née Gluck), who investigated the case independently of CUFOS and agreed with Hynek's verdict of "unexplained." A close encounter in Mansfield, that has since become known as "The Coyne Incident," is still raising eyebrows among believers and UFO investigators. In UFO lore the "Coyne Incident" is regarded as one of the most reliable UFO sightings of all time. My investigation began a few days ago, when I was challenged to debunk this case, which was used as evidence supporting some kind of anti-gravitic effects of UFOs. So I did that. The likely culprit emerged quite soon, as there aren't that many aerial alternatives that could be expected to come so close to other aircraft in such setting. Working out all the details took more days, as this case is documented well enough to actually have a lot of details to process, and some of the necessary information isn't easy to find. There's some historical context that should be noted that might explain some aspects of this case. we were flying east of Mansfield, and there had been some conversation previously about UFOs because at the time there were a lot of stories coming out... the governor of Ohio had seen them. Keeping those in mind, it's not too surprising if they were thinking of flying saucers while seeing something unfamiliar in the sky. When Oct. 31 finally arrived in 1973, the UFO fever began to cool. Police phones weren’t ringing off the hook. Stories of glowing disks skimming the tree tops had dried up. The buzz was tapering off mostly because the public’s sudden rush of a mind-boggling reality was being tempered with heavy doses of explanation. Just across the border in Indiana, police had spied on pranksters preparing to launch homemade hot-air balloons made of balsa wood, plastic dry cleaner bags and birthday candles for lift-off. In Xenia, three man-like creatures with silver skin were spotted walking along U.S. 35. Scared out of their wits, drivers called police, who were quickly on the scene. The “creatures,” however, turned out to be high school-aged pranksters wrapped in tin foil. Perhaps the most sobering answer to the UFO wave of October 1973 is offered by none other than Wright-Patterson Air Force Base, a mythological location in UFO history to begin with, as UFOlogists believe the apparent spaceship that crashed at Roswell, N.M., in 1947 was transported to “Wright-Patt” and stored in Hanger 18. On Oct. 6, 1973, the Yom Kippur War erupted when Egypt and Syria, along with 10 other Arab nations, invaded Israel. Desperate for survival, Israel threatened to launch nuclear warheads against the Arab world. Thus seeing the apocalypse on the horizon, the White House made the decision to come to Israel’s aid, ordering the U.S. Air Force to execute “Operation Nickel Grass” beginning Oct. 13. Within hours of the order, Wright-Patt was buzzing as an armada of military cargo planes stuffed with war materials were taking off for the Mediterranean Sea around the clock and would do so for the next 30 days. Could it be that all those witnesses from southwest Ohio were seeing military ships and crafts from this world? “Ground Zero” of UFO flap 1973 is easily just thirty to forty miles east of Wright-Patt, which is located in southwest Ohio. Eighty to a hundred calls a night about strange lights were being logged from there. The Coyne incident happened 150 miles to the northeast. Thus most of the “flap” occurred relatively in the same direction that an armada of US Air Force aircraft was heading, day-after-day, beginning October 14th, 1973. Could it be that all those witnesses were looking at ships and crafts from this world? Soon US Air Force planes stuffed with equipment were flying over the Atlantic, stopping only in Portugal for more fuel, and then racing down the middle of the Mediterranean Sea to Israel. All told, Operation Nickel Grass resulted in 567 missions carrying close to 22,000 tons of cargo. Much of it flown out of Wright-Patt, one of the largest air bases in the world. Strategic Air Command (SAC) KC-135As were the first to arrive at Lajes Air Base. The Stratotankers had left Pease AFB, New Hampshire, the night of Saturday, 13 October (one of the bases El Al was using to re-supply the war effort); the tankers were ferrying factory-fresh Douglas A-4 Skyhawk and McDonnell Douglas F-4 Phantom II aircraft flying non-stop from the factory in St. Louis, Missouri to Ben Gurion Airport. The primary source for this research was The UFO Enigma: A New Review of the Physical Evidence by Peter A. Sturrock, which contains the original witness reports and interviews. That book concludes "The object encountered by the Coyne helicopter crew remains unidentified despite many hours of face-to-face interviews with the observers and many months of supplementary investigation, consultation, and analysis." Other sources are marked in the text below. Since they were interviewed years later and after the story had been reported, there are obvious risks that those influenced their memories. However, for the most part their story seems to reflect pretty accurately what likely happened. At around 22:30 on October 18, 1973, the helicopter took off from Port Columbus Airport (nowadays John Glenn Columbus International Airport) on a return trip back to Cleveland Hopkins Airport, as pictured, cruising at 90 knots at an altitude of 2,500 feet. The black circle indicates where the incident happened at around 23:00 and happens to match an approximated straight line trajectory. 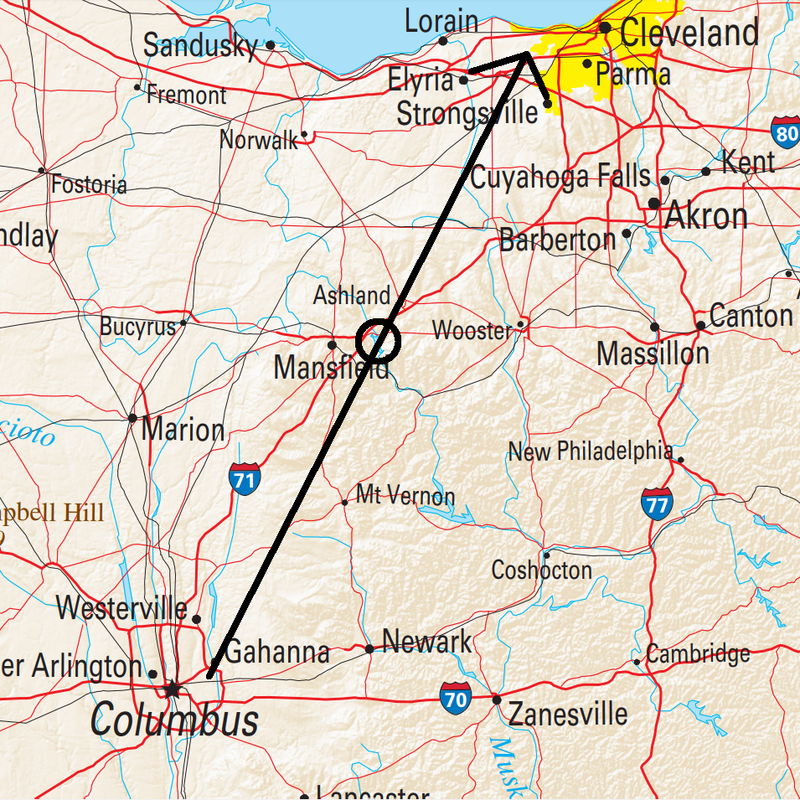 After the incident they hurried back to Cleveland at 110 knots, almost the max speed, and arrived there safely but shaken, while almost running out of gas because they hadn't refueled in Columbus. The following is probably the first realistic reconstruction of the actual path of the UFO/plane, drawn based on the estimated cruising speeds and timings of the events. The approximate path of the helicopter is shown in black, the route of the car of ground witness Mrs. C and her passengers is shown in purple, and the best guess path of the UFO is shown in orange. The large black circle indicates the location where they all met, and the smaller circles and the accompanying labels and narrower lines indicate the approximate locations, viewing directions and times of the reported observations. Mrs. C made the initial observation while driving her car. She described it as a single steady bright red light at her two o'clock position, at medium altitude, flying south, paralleling the road she was driving, with a speed "about that of a jet". So basically she described an airplane lacking blinking anti-colllision lights. At that time the plane was probably cruising at more than double the speed of the helicopter. A few minutes later Healey, who had the best visibility towards west, saw the same thing, but thought it was irrelevant traffic. Unbeknownst to them, the UFO/plane probably began a more or less standard rate turn of 180+ degrees upon noticing them, and began to adjust it's speed and location for approaching the helicopter. Some minutes later, Yanacsek who now had the best visibility from his rear right seat noticed the light on the right, pacing the helicopter. After having looked at it for a minute he notified Coyne, and after further 30 seconds announced it's closing in. At that point all but Jezzi with his obstructed visibility were looking at that light, increasingly worried, and soon Coyne decided to take the controls from Jezzi and began descending at 500 feet/minute, which he later increased to 2000 feet/min to avoid an expected collision with the object he estimated was coming at them at 600 knots, which seems to have been just a huge misestimate. Those are common when all you can see is a light at unknown distance without reference points, like mistaking Venus for a UFO or expecting a meteor to fall somewhere close by. Coyne initially believed it could be an F-100 fighter, and he tried to contact Mansfield airport control tower while descending to ask if there are high performance jets within the area, but his radios didn't work. He asked something similar later after the event as he seems to have been fixated to the idea that it was very fast and hence had to be a fighter jet if anything. Mansfield answered there were no F-100s flying there at the time. He asked the wrong question, as in reality it wasn't that fast, and neither a fighter jet. Luckily Mrs. C happened to be driving just towards the location where the encounter happened, and provided another viewpoint. This time they they saw two steady lights, a big red one followed by another dimmer green light, which they initially thought to be a plane, as it was, but changed their minds. They saw those initially at their one o'clock position which then appeared to move farther towards the right to two or three o'clock position or even stop momentarily. They did neither, the road just turned left at that point, like the map shows, so their one o'clock became two o'clock, and while it happened, it momentarily cancelled out some movement from their point of view. While they slowed down their car, the lights also seemed to slow down, which is hardly a surprise, as their movement towards them contributed to the apparent relative movement, and obviously so significantly, that contrary to the extreme speed estimates of Coyne, the relative speed toward them seemed to be more comparable to the speed of the car. The lights also seemed to be farther apart as they came closer, which happens when the angle between the lights increases, as pictured below. While watching those, they came aware of the second set of lights, those of the helicopter, that were closing in from the southwest. They thought they were about to collide and saw how they converged, so that the larger unknown object went over the top of the helicopter. Camille draw a picture of what she thought she saw, which was sort of a classic saucer UFO with red light in the front, green at the back, and also a yellow in the middle, which no other witness mentioned. That could have been an indicator light on the refueling pod, which have red, green and yellow/amber signaling lights. Yellow/amber signals that the tanker is ready for contact, so it would make sense for it to be lit when the plane got into refueling position. At that stage the helicopter view had also noticed the green light as well and Coyne also later draw a tubular domed craft with a red light at the front and described how the red light at the front and a green at the back seemed to reflect off gray metallic structures. Which they no doubt were. So what sort of a weird plane has a red light on its nose and green at the back? Not that one. Here's what the normal navigation and anti-collision lights of a plane look like. So there's red (1) on the left, green (1) on the right, and white (2) on the tail. Their purpose is to signal which way the plane is going. And as you should now see from the map and the descriptions, they did their job just fine, witnesses just didn't understand the information that was given. All the way until the encounter, everyone saw only the left side of the UFO, and hence the red light, while the green one was most likely hidden behind the fuselage. When they got close enough, they also saw the green one, which looked dimmer than the unobstructed red, as it was still only partly visible from the other wingtip. Contrary to what everyone seemed to believe, the UFO wasn't going from east to west but south to north. The relative sideways movement towards the helicopter just made it look like that. It's rather obvious the witnesses concentrated too much on that apparent sideways movement instead of the forward one, which in fact was much faster. Both the helicopter crew and those on the ground reported that the object temporarily stopped and hovered over the helicopter. You can't stop and hover above a helicopter that is traveling forward at 100 knots! The changes in altitude might have also confused the ground witnesses somewhat, as for them those would have looked similar to changes in speed or location at the same altitude. The apparent brightness could have been caused simply by the plane being closer and lower than the witnesses expected. But what about those other lights? Should they have seen the white tail light (2), the anti-collision lights (3)? The tail light visibility should be at least 140 degrees, so it should become visible when the plane is viewed somewhat from the back. Healey probably didn't look at it after it had passed them, and on since it was pacing the helicopter on the other side, the tail light would not have been visible while they were approaching each other. Mrs. C stated to have seen the plane in her 2 o'clock position from the car, so depending on the accuracy of that estimate and exact angle of the flight path of the plane at that point, she may or may not have seen it. Which means it's unclear if it was turned on or off at that stage. And we didn't see a strobe or a rotating beacon, either. Which is an FAA regulation. You've got to have it to fly at night. But the lighting [configuration] shoots my whole theory down. If it was a high-performance aircraft, it must have had a nut for a pilot. The lights were all wrong, and only 500 feet above the hills? At night? I'd hate to do that with a Lear at that speed. It wasn't a jet, neither a Lear, and at that point they were probably already higher than they thought. An approved aviation red or aviation white anticollision light system on all U.S.-registered civil aircraft. Anticollision light systems initially installed after August 11, 1971, on aircraft for which a type certificate was issued or applied for before August 11, 1971, must at least meet the anticollision light standards of part 23, 25, 27, or 29 of this chapter, as applicable, that were in effect on August 10, 1971, except that the color may be either aviation red or aviation white. Operate an aircraft that is equipped with an anticollision light system, unless it has lighted anticollision lights. However, the anticollision lights need not be lighted when the pilot-in-command determines that, because of operating conditions, it would be in the interest of safety to turn the lights off. In this case, the plane was most likely a military aircraft that had anti-collision lights installed before 1971, so it's unclear which rules it needs to follow. (2) Navigation Lights Steady Dim (Tail Off). (6) Leading Edge Lights Off. So at least currently at that stage, the lights should be configured pretty much as seen, although the procedures could have been different in 1973. Most lights are turned off as strobes and bright lights can cause disorientation and other issues from close distance and when using night vision equipment, fulfilling the rule of being safer to turn them off. There are also separate procedures for refueling with minimal visual and radio emissions when needed. Note how only the farthest helicopter seems to have a blinking light and the tanker has only one steady bright white light on the back of one wing, probably in a refueling pod, which are located on both sides around that location on that model. Navigation lights might have been turned to so dim that they cannot be seen in the video, even if they were on. It could be that the white light the helicopter crew saw when the plane left was that instead of the tail light. Much of the weirdness of this story can be attributed to that bright green moving light that illuminated the helicopter for some seconds as they met. All the crewmen already recognized in their interviews how the helicopter had a green plexiglass roof, known as the "greenhouse", and how the color of that powerful light could have been caused by it. Jezzi only saw a bright white light, probably because he was in a suitable position in the front so that the light didn't come to him though that green roof. Healey didn't remember the helicopter turning green. Mrs. C on the ground didn't see such green light but the youth did for at least an estimated 10 seconds. They gave various accounts on how according to some of them, it was a "dull green light", it seemed to come above the helicopter and color the helicopter green and made its windows visible. They said it seemed to color everything to green temporarily. The light was most likely actually white, but the combination of seeing the insides of the helicopter become green due to the sunroof and the green forests around them made it seem greener than it was, especially since they apparently didn't see the actual light source, as the helicopter was in between. Note the strong highlight and how the pilot looks greenish. But some tankers are actually also equipped with more powerful searchlights, especially when they double as search and rescue (SAR) airplanes. Here are the actual witness statements regarding that green light. Note that two of the crew members didn't even see the inside of that helicopter turning green (one in the front seat and one in back), and the only adult on the ground didn't see that green light either, even when the interviewer was quite obviously trying to get such answer, probably confusing that to the green navigation light. At least Healey also might have been mixing descriptions of those two separate green lights. Now, the light swung 90 degrees and came into the cockpit, here. Now, we fly at night and these instruments are all red lights, here. Everything turned green. Now, it could be, maybe because of this [indicates green-tinted panels of overhead windows]. It had a steady red light on the nose; it was cigar-shaped and had a green light shining down from the aft end. The shaft of green light coming out of the underside of the aircraft. You could actually see a cone of light, a definite cone, a light that stuck out at right angles. I saw the green beam as the [object] was in front of me, out the front windshield. I didn't see it as it was going away [to the west]. I really don't remember the inside of the aircraft [the helicopter] turning green. I don't remember the green cockpit or the descend or the climb. I know Larry said the light swiveled, but I don't remember that. The green was in the cockpit, but I think it came from the 'greenhouse.' It was green inside the cockpit. The green light also came in through the windshield, which is not tinted. What happened there... it wasn't just a one-shot light; it seemed to swivel. Now again, whether we flew through it, or it swiveled, at any rate the light traveled across our nose into the cockpit and then up into the green area, and it washed out the entire cockpit. It might have been a maneuverable spotlight, or it might be we were passing under it; it did shine in the front. It came up over the nose into the cockpit windshield, and then it came up into the 'greenhouse.' It was wide an intense, like an aircraft light. Now, it was mentioned that there was a greenish light that colored the aircraft, that turned the Huey green for a moment as it went by. I didn't see that or sense it, and I think that since the cockpit has a greenhouse - a green Plexiglas roof - that was the effect we saw. Jones: What color was this object? Mrs. C.: What do you mean? Jones: What color did you see from it? Mrs. C.: Just the red and the green. Jones: Do you mean from the helicopter? Mrs. C.: No, from the object above the helicopter. Jones: Were the red and the green the same size? Mrs. C.: No, the green light seemed smaller. It was not of the same brightness. Jones: The green was smaller? Mrs. C.: Yes. There are different versions. I know the kids have seen something... They say they see something a little different than I do, but I'm just telling you what I saw. Now that we understand how the witnesses mistook the wing tips as the nose and the tail, we can also understand the descriptions of where the plane went after the encounter. The crew wrote to their report that it "slowly continued in a westerly course, accelerating at a high rate of speed, clear west of Mansfield airport then turn 45 degree heading to the Northwest." In reality it never was on a westerly course, and never accelerated that fast, it just began slowly turn away from the helicopter. I will say that it was moving faster than normal traffic at that low altitude. Closer to the 250 than the 600 [knots]. Since the plane began ascending back to its normal cruising altitude, it would have looked as if it got rapidly much farther and close and beyond Mansfield, and then somewhere over the horizon, due to the parallax effect. It would have also been difficult for the crew to estimate that effect, even if they realized the plane was ascending, since their own altitude was changing at the same time. That reported 45 degree turn might have been simply caused by the plane ending its climb, or alternatively the helicopter was climbing equally fast at that point, cancelling the relative visual effect. At that point it would look as if the plane didn't go further to the west anymore but just began to go more or less towards the same direction, so roughly north again, as they described. Curt on the ground told he saw it going towards Mansfield and getting smaller and smaller on the horizon northwest and then reversing itself and starting to backwards. That's because he still mistook the sideways movement to the forward one and that's what it seemed like with that assumption. He saw that after they went back to their car and drove on a road that has turns to both directions, so it's pretty hard to know if he was simply mislead by the movements of the car, or similarly by the altitude changes of the plane. 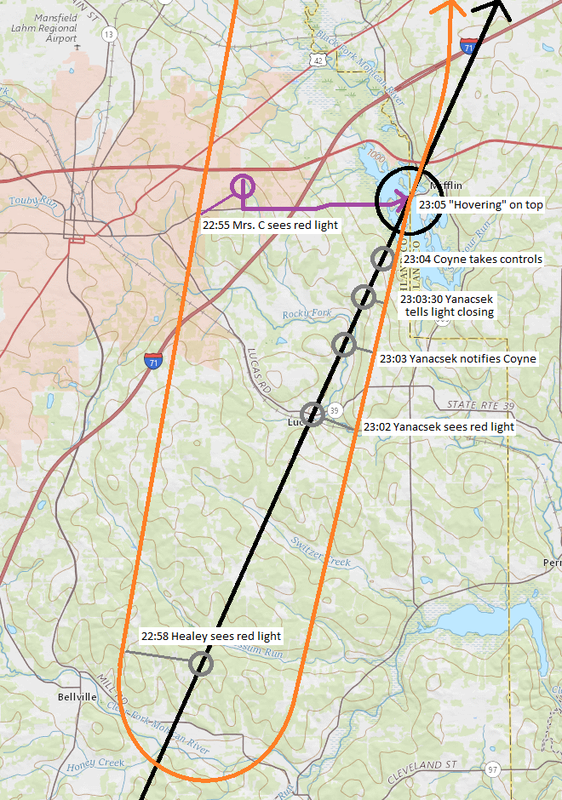 When the plane left, the witnesses only saw a white tail/aft light, that was similarly described to have been very bright, possibly also just because it was so close and closer than they though. Since the plane was now flying away from them and other witnesses, it most likely had the red and green navigation lights on, but they just weren't visible when looking from the back. If the tail light wasn't on before, it was at least turned on after they left, as it should have. Unless they saw something else than the tail light. Remember the above video with a white light that seemed to be near the refueling pod. It could have been that as well, which means the actual tail light would have still been off. For some reason the plane apparently still didn't turn on the anti-collision lights. That seems to indicate they flew without those for a longer time. When Mrs. C initially saw it without those lights, it was way too far to have turned those off because of an anticipated refueling operation. Even if it had just refueled someone else and turned those off, it should have probably had turned those on again at that point. According to the helicopter crew, the night was "clear, calm, starry, and moonless" with visibility of 15 miles, very much suitable for refueling operations. So there probably wasn't any particular reason for the need of such lights, but also nothing special that would have prevented their use, like clouds that would have made strobes distracting for the pilot. Obviously this story really got its wings from the part where the mystery craft supposedly pulled their helicopter up. I wasn't aware of the climb at all - and 1,000 fpm - it could have been less. It was not that much of a climb, that steep, that much acceleration. But the climbing is something that occurs somewhat easily in a helicopter if you're not paying attention. If you're flying the aircraft and thinking of something else. We were talking rapidly about what was happening. You get excited and you just go like this [demonstrates by raising left arm] and you're climbing. And going from 1,500 to 3,000 feet in two or three minutes is not going to be extraordinary. There are thermals that are so bad that you put your collective down and you're still climbing. I've had it happen to me. Zeidman: Do you think Larry was responsible for the climb? Jezzi: I don't know. Larry said, "Son of a gun, it pulled us up!" Jezzi: No, I didn't have the controls. I don't know what he did. Ground witnesses didn't report seeing upwards movement. Coyne said he noticed they were climbing but apparently none of them actually looked at the altimeter for several minutes. When they finally did, they noted the altimeter showed an altitude of 3,500 feet and rate of climb of 1,000 feet/minute, which is also well within the capabilities of that helicopter alone. In an interview with Zeidman, Coyne stated he noticed that altitude while they could still see the object, and Jezzi that it had just disappeared, so it seems the plane had already flown quite far (or at least that's what it seemed to them) before they looked at their altimeter. while we could still see it, I says, "My God, we're at 3,500 feet," and I says, "What's happening?" The collective was bottomed. It wouldn't go down any farther, and while I was looking at the instruments, the altimeter was going up to 3,800. I pulled the collective up and then pushed it down and the helicopter seemed to settle." Everybody was yelling and screaming about what the hell it was and that it almost hit us. That kind of conversation kept up for several minutes. it scared the living hell right out of me. But, it's actually possible the plane did pull them up, like birds do, or at least contributed to that effect. So there's downwash right behind a tanker, except for close to it directly behind the ramp door there's actually significant upwash, and upwash again on the sides. So what happened in this case? Depending on the exact position, the helicopter would have initially experienced either one of those, but that stage didn't seem to last that long. When the plane left, it began to move towards the left and gain both altitude and speed. Which means the helicopter would have ended towards the upwash region. Even though the plane accelerated farther, the vortex is also larger farther away, so it's likely the helicopter would have stayed in such region for some time. The key to airplane drafting is not to be as close as possible—what Erbschloe calls "fingertip formations . . . white-knuckle, hard flying." Instead, the trailing C-17 was spaced in sweet spots 2000 to 6000 feet behind the lead airplane, places where the vortices are fully formed and pushing air upward. 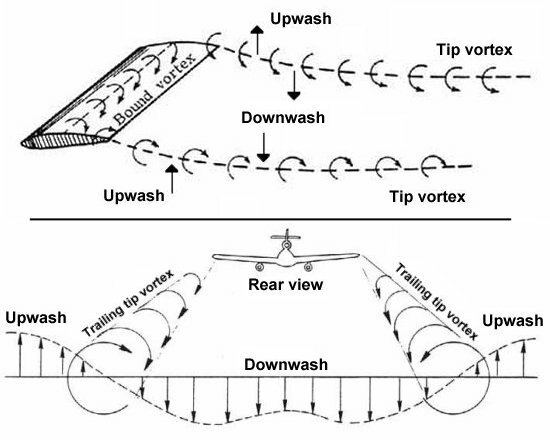 (If a plane flies in a spot where the vortex is pushing down, it uses more fuel.) This updraft provides lift with no extra fuel. Air Force flight test engineers with Aeronautical Systems Division (ASD) at Wright Patterson AFB hypothesized that helicopters could actually ride on top of the wingtip vortices trailing behind a C-130 Hercules transport. They believed the helicopter would be able to reduce power and extend its range by “drafting” behind the Hercules. A feasibility test at Wright-Patterson in 1965 demonstrated good compatibility between a CH-3 and C-130. Follow-up trials at the Air Force Flight Test Center at Eglin AFB, FL quantified the CH-3 power reduction to be 28 percent, resulting in a 25 percent increase in range. Eastman began by flying the H-3 behind the C-130 cargo ramp but quickly found out that because of the airplane’s tip vortices, the areas just aft of the vertical stabilizer and cargo ramp had a very strong downwash. Once in position in these areas, Eastman had a hard time controlling the H-3 and would enter a very quick descent. Sometimes the descent would reach 2000 feet per minute with very little control authority. After attempting this several times with the same results, Eastman decided to take a break. In order to collect his thoughts he moved the H-3 from directly aft of the C-130 to flying formation off of the left wing tip. Once in position on the wing tip, Eastman noticed that there was a significant power reduction for the H-3. For some reason it took roughly forty to fifty percent less power to maintain position when flying off of the wing than it did when flying directly behind the C-130. It was this discovery that made helicopter aerial refueling possible. Originally it was thought that the power reduction was a result of a decrease in dynamic pressure, much like race cars use when drafting off of each other. However, Eastman later proved in a graduate school thesis that this power reduction was a result of the vortex effect from the C-130’s flaps reducing the helicopter’s induced power requirement. The upwash from the flaps increased the helicopter’s effective angle of attack, reducing the induced drag and requiring less power to maintain the speed needed to keep up with the C-130. Coyne reported that he initially thought they were climbing because of turbulence but he couldn't feel any, neither noise. That's because they were below it and the plane on top of them knew where it needs to be not to cause much of it. It wasn't their first time. After it left, they continued to climb, even when he tried to push the controls down, most likely because the plane had caused upwards draft. They eventually felt a "bump, like it hit turbulence then", because they did. He thought the "thing" was already "way to the west" at that point. It most likely wasn't, he just misjudged the position. It was still close enough to cause turbulence at that higher altitude. Then the turbulence began to ease and they began to descend below it. The helicopter crew stated that the object was silent or that there was no sound. But they were inside a helicopter, going close to its maximum speed, so it's hardly a silent environment that would enable them to determine if it was "silent". At that point the plane was going close to its stall speed with minimum power, so it can be expected to be relative quiet at that point. The witnesses on the ground reported they heard "a whole bunch of noise", that was like "a bunch of racket", "sort of rattling, like tin or a knocking sound".Since the helicopter and the plane were approaching them at roughly from the same distance at the same speed, they would have likely heard the combination of their sounds. But did they refuel helicopters, especially at night, in 1973? Note how that particular type even has a "dome" on top. Were those flown to departure airports within the US first in a hurry, helped with aerial refueling? Major Harry Dunn from the H-3 System Program Office at WPAFB called me one Friday afternoon and asked if I could fly the CH-3C in close formation behind the ramp to see if they could extend a hose out to the helicopter for aerial refueling. Because of the C-130 tip vortices, the C-130 vertical stabilizer and the aft ramp were in a very strong downwash area. The CH-3C reaction was to start descending at about 2000fpm and the flight controls become ineffective, in that you can not roll, pitch, or climb -- no matter whether you use full control defection. We went down vertically about 3000-4000 feet before the helicopter became stable. Anyway we got tired of trying to scare ourselves, so I told Bob Nabors that we would fly on his wing for a few minutes and rest. Bob was using 70 degrees of flaps to fly at about 100 knots. We were in tight formation on the left wing and I noticed our power reduce about 50 percent so I thought Bob was descending. He told me he was level, so we really starting looking at this position for the next 30 minutes. We knew that the Marines used refueling pods on their wings for fighters, so we thought we had something with this 40-50 percent power reduction. Within 10 seconds I made the First Helicopter Aerial Refueling hook-up in Aviation History. I maintained the connection for 5 minutes which was more than needed for an aerial refueling. The first refueling was completed December 15, 1965. The Marine KC-130F was flown by Captains W.J. Smith and R.R. Mullins of Cherry Point MAS. I forgot to mention in the first paper that I also flew the CH-47 Chinook and the UH-1D, which I was testing for the Army, to check for power reduction in the formation position. They both had power reductions but not as great as the H-3. We later measured the power reduction through flight tests. The greater reduction occurs at the slowest speed, maximum C-130 flaps (Most important parameter), the highest gross weights of the C-130 and Helicopter, lowest altitude and temperature and on the left side. There is a position on the right side that has the power reduction, but it is not as great a position as the left position. The left side is better because the rotor blades are turning counter clockwise. The flight test program was divided into three phases. ... Phase 1 was conducted between July 14 through August 23, 1966 at Wright-Patterson AFB. Phase 1 used the CH-3C and Phases 2 and 3 was conducted between December 14, 1966 through January 13, 1967 and used the HH-3E. A total of 600 aerial refueling connections were performed including 90 night refueling probe to drogue connections. Basically, the helicopter aerial refueling was a piece of cake and I believe it is the easiest airplane to refuel. So we were tasked by the Air Force to demonstrate that the HH-3E and the HC-130P could travel 2200 nautical miles. On December 29, 1966 we completed that mission flying from Dayton, Ohio, down to the Gulf Coast and back and around to get the 2200 nm. ... We refueled 4 times, transferring 18,200 pounds of fuel during 18 hours of flying time. ... The trip to Paris required 30 hours of flying because they did not follow the great circle route, which we had recommended. ... Our mission was uneventful because we flew in and out of weather and made one night refueling. I Flight Tested the HH-53B for Aerial Refueling during 19-26 June 1967 at Sikorsky Aircraft Company Stratford Conn.
We conducted day and night evaluations and the HH-53B performed very well with a lot of power and more stability than the HH-3E. You can see some of the historical pictures of those early demonstrations behind that link. Note that he also tested it with UH-1D, which is a variant of the same model Coyne was flying, but that has less relevance, as they are not normally equipped with probes and the plane was most likely expecting to find a helicopter of a different kind. The description of that first test was especially interesting, as he described how the helicopter started to descend uncontrollably at 2000fpm regardless of the controls, and how tuning the flaps and positions changed the situation. At 0105 hours, 31 May 1967, two Sikorsky HH-3E Jolly Green Giant helicopters, 66-13280 and 66-13281, from the 48th Aerospace Rescue and Recovery Squadron, United States Air Force, took off from Floyd Bennett Field, New York and flew non-stop across the Atlantic Ocean to the Paris Air Show. They arrived at Le Bourget at 1351 hours, 1 June. The flight covered 4,271 miles (6873.5 kilometers) and took 30 hours, 46 minutes. Nine in-flight refuelings were required from Lockheed HC-130P Combat King tankers. The aircraft commanders were Major Herbert Zehnder and Major Donald B. Murras. Where the conditions suitable for attempting refueling, that is, apart from the helicopter not expecting nor being equipped for it? The choice of airspeed and altitude for refuelling will depend upon the performance capabilities of the tanker and the helicopter. Typical refuelling airspeeds are in the range 105 to 120 KIAS, with 110 KIAS being the routine refuelling speed. Maximum hose extend/ retract airspeed is 120 KIAS and after full extension of the drogue with receivers in contact the maximum airspeed is 130 KIAS. At speeds lower than 105 KIAS the drogue may not inflate properly and may possibly droop, thereby reducing the clearance between the helicopter rotor blades, the hose and the tanker’s tail. The Hercules tanker minimum refuelling speed is 3 - 5 KIAS above the power-off stall speed and the normal configuration for refuelling is 70% flaps, undercarriage up and level flight. The altitude range for helicopter refuelling is typically from 1000 ft to 3000 ft AGL, although higher/lower altitudes may be used when mission requirements dictate. Pretty much a perfect match.And as was already mentioned, the weather was pretty much perfect for it as well. 1. Introduction. In this procedure the tanker approaches the receivers along the reciprocal of the refuelling track and makes a procedure turn back onto the receivers’ track. The type of procedure turn used depends on the equipment available. 2. Procedure. The tanker uses all available aids to achieve and maintain the reciprocal headon approach with a minimum height separation of 1000 ft from the receivers. The receivers are to confirm level at the join-up altitude. a. Range and Bearing Available. The tanker flies the pattern shown in Figure 9G-1. When the turning point is reached, see Figure 9G-2, the tanker turns right through 45° using a half standard rate turn, holds the new heading for 1 minute 15 seconds, then turns left through 225° again using a half standard rate turn. b. Bearing only Available. The tanker flies the pattern shown in Figure 9G-3. When 5 nm from the receivers, the tanker reduces speed to 180 KIAS. As the receivers pass the wing tip, the tanker turns left or right through 210° using a standard rate turn. On completion of the procedure turn, the tanker climbs or descends to the refuelling altitude. When level at the refuelling altitude the tanker should fly at 180 KIAS, lower flap as required and close to ½ nm astern. When the receivers have confirmed level at the join altitude, the tanker commences the join. That seems to be exactly what it did. Even if the plane was following the protocols, the helicopter surely wasn't? Actually, it seems they pretty much did, even if it was accidental. a. The helicopter will maintain the highest single engine airspeed possible consistent with the operating limitations. The receiver must notify the tanker of this speed. (1) If the receiver airspeed is 105 KIAS or higher, the tanker will complete a standard join up. (a) Refuelling altitude will be 500 ft below the receiver’s cruise/join up altitude. (b) The refuelling airspeed will be the tanker’s minimum operational speed or the receiver’s speed, which ever is the highest. (c) The tanker will perform a standard RV but expect the receiver to establish receiver high procedures. (d) When 2 nm in trail the tanker will slow down to below 130 KIAS. At 1 nm in trail the tanker reduces speed to 110 KIAS. On approaching the 3 o’clock position the tanker is to establish the refuelling speed, hose trailed. Warning. When operating at or near these minimum operating speeds, any bank angle could result in a stall, without warning. b. As the nose of the tanker passes the helicopter’s 3 o’clock position, the helicopter will initiate a shallow dive to accelerate and close on the tanker. The altitude differential should be sufficient to gain the additional airspeed required to manoeuvre into the precontact position. c. Once established in the pre-contact position, the power required to stay with the tanker will be less than that required to maintain the same airspeed outside the tanker’s draught effect. Care should be taken not to lose airspeed as there will not be sufficient power available to manoeuvre back into position. That's what they did. The helicopter was flying below 105 KIAS, initially 90 knots, but began a shallow dive and accelerated the speed to 100 knots when the tanker approached, just like it was following the procedure. Note again the mentioned tanker's draught effect, which could have been at least partially responsible for that lift as well. 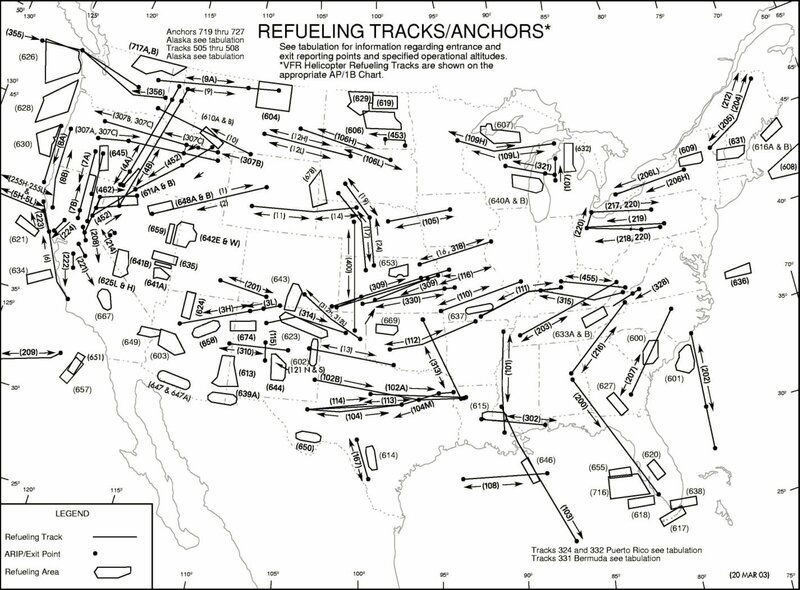 Refueling tracks are specified paths of the airspace where aerial refueling can be performed. There are plenty of those over the US. At least in 2003, there apparently was a refueling track close to the path taken by the helicopter and in the correct direction, but it was too much to the west, on the other side of Mansfield. Was there a refueling track in 1973? I haven't been able to find such information yet, but it would make sense. At the time, since 1971 after the Clinton County Air Force Base was closed, the 160th Air Refueling Group was positioned to Lockbourne Air Force Base, which was on the south side of Columbus, along the same path. At the time they were primarily using at least KC-97L Stratofreighters/tankers, and moved to KC-135 Stratotankers in 1975, but those were already present at the base earlier, and probably other models as well. Tankers use two alternative systems for refueling: the flying boom and the probe-and-drogue. Only the latter is suitable for refueling helicopters, so that would seem to eliminate models that use the boom, as those shouldn't have been considering to refuel a helicopter. However, things are a bit more complicated than that. Some boom models have been converted to probe-and-drogue, some can use adapters, and then there are additional drogue pods that can be installed on the wings, possibly in addition to a boom. Such pods can also be used with models that are not primarily tankers. At least the following models were in use at that time. KC-97 is a variant of C-97 freighter and uses a flying boom. However, one plane was experimentally converted into a hose-and-drogue system and designated KC-97H (serial number 51-332). At the time it was already an old model, being phased out, but still in use with Tactical Air Command, the Air Force Reserve, and the Air National Guard, which included the 160th Air Refueling Group (ARG) that was located to Lockbourne Air Force Base near Columbus. They were using KC-97L variants, which had additional jet engine pods mounted on the outboard wings. KC-135 is a turbofan/jet powered successor for the KC-97 and entered service in 1957. 160th ARG was the first Air National Guard unit to convert to KC-135 Stratotanker in 1975, but those were already in use in Lockbourne earlier. Two KC-135A models collided on the ground there in 1973. It has a flying boom but some variants have used boom to drogue adapters and wing mounted drogue pods, but at least the latter is a much more recent addition. The only external difference between a KC-135R and a KC-135T is the presence of a clear window on the underside of the empennage of the KC-135T where a remote controlled searchlight is mounted. KC-130 is a turboprop powered tanker that has two wing-mounted hose and drogue pods, suitable for fueling both planes and helicopters. Two variants were in use at the time, KC-130B, which were the original six C-130B models that were converted to tankers, and KC-130F, which was the improved and more numerous version of KC-130B. HC-130P and similar MC-130 are specifically helicopter aerial refueling versions of HC-130. HC-130P entered service during the Vietnam War in 1966. It is turboprop powered and happens to be the one that had a "dome" on top, as pictured before, and a very distinguishable nose part, which seem to fit to Coyne's description and drawing. However, since Coyne mistook the wings for the fuselage, those hints may be misleading. KA-3B is a tanker variant of A-3B bomber and EKA-3B a variant of it with additional electronic countermeasures features. They are turbojet powered and use probe-and-drogue system. It is unclear if they were ever used to refuel helicopters. KA-6D is the successor for KA-3B that were used to refuel other strike aircraft. It is unclear if they were ever used to refuel helicopters, but at least some variants had a stall speed of 98 knots which could be low enough. At least the primary usage of KA-3B and KA-6D seem to have been fueling similar airplanes and not helicopters, even if their stall speed might allow it. KC-135 is primarily a boom based system and it's unclear if those drogue adapters were available at the time. At least the current models seem to have an AAR speed envelope between 200 and 320 KIAS, which would be way too fast. KC-97 is primarily a boom based system, but there's at least that one exception. That seems to leave KC-130 and HC-130P as the most likely options. Both of those are C-130 Hercules variants, turboprop powered drogue systems, and designed to refuel helicopters. Both have AAR speed envelopes extending down to 105 KIAS (with low speed drogue) and AAR altitudes extending down to 1000 feet. While KC-130 is primarily a tanker/transport with Marine Corps as the primary user, HC-130P is a search and rescue (SAR)/helicopter refueling aircraft primarily used by the Air Force, and nowadays also by the Coast Guard. Since one of the key elements of the Coyne incident was the powerful searchlight and the testimonies contained some details how it seemed to function, it could be used as a differentiator between those models. Unfortunately, those kinds of details do not seem to be easily found. However, since the HC-130P actually entered service in 1966 as a combined Search and rescue (SAR)/helicopter refueling aircraft, it at least can be expected to have a powerful searchlight for such use. The HC-130P/N is an extended-range, combat search and rescue version of the C-130 Hercules transport. Its mission is to extend the range of combat search and rescue helicopters by providing air refueling. Secondary mission capabilities include performing tactical airdrops of pararescue specialist teams, small bundles, zodiac watercraft, or four-wheel drive all-terrain vehicles, providing direct assistance to a survivor in advance of the arrival of a recovery vehicle. Other capabilities are extended visual and electronic searches over land or water, tactical airborne radar approaches and unimproved airfield operations. Combat search and rescue missions include flying low-level, preferably at night aided with night vision goggles, to an objective area where aerial refueling of a rescue helicopter is performed or pararescuemen are deployed. The secondary mission of the HC-130P is peacetime search and rescue. The HC-130P/N is the only dedicated fixed-wing combat search and rescue platform in the Air Force inventory. First flown in 1964, the aircraft has served many roles and missions. The aircraft was initially modified to conduct search and rescue missions, provide a command and control platform, in-flight-refuel helicopters and carry supplemental fuel for extending range or air refueling. That sounds like a pretty perfect match again. Because of the SAR use, it can be expected to have a powerful searchlight. It is preferably used at night, flying low, refueling helicopters. The crews are trained to minimize external lighting and communications, which would make this event a good fit for a training mishap that had radio silence and only used the absolutely minimal lights for external visibility. That dome is actually an AN/ARD-17 Aerial Tracker Radome, which was originally developed as an entry direction-finding system for identifying and minimizing the recovery area of Apollo command modules returning from moon missions by following the signals they transmitted. Those were installed to HC-130s that were used as the rescue aircrafts. At least the Boeing KC-97 Stratofreighter/Stratotanker can have a somewhat smaller dome too. But since those witnesses mistook the wings for the fuselage, they probably didn't draw that dome, but rather mistook the actual fuselage, tail, an engine or some other part for a dome. Some HC-130Ps also have a small ball shaped structure under their nose. That can contain FLIR/cameras or in the older models there was a Fulton surface-to-air recovery system (STARS) for retrieving persons from the ground with a lift line, also seen in James Bond. HC-130N variants (first built in 1970) do not have that system and those have been removed from all extant USAF HC-130P models as well. Coyne estimated the object to be 50-60 feet in length. The length of (H)C-130 is 97 feet and the wingspan is 132 feet. Zeidman: Going back to the radio malfunction, to what do you attribute the radio malfunction? Was that an unusual event? Jezzi: In that unit, no. It happened from time to time. Because our maintenance, our avionics, were not that good. Zeidman: Do you know anything about the magnetic compass malfunctioning? Jezzi: Oh yes. Triple-four's magnetic compass was never the same afterwards. Whether it was like that before I don't know. Zeidman: Larry says the compass was changed, replaced. Jezzi: Yeah, they did that, I recall. I know they did that after the incident. That mag compass never worked. Zeidman: He said the RMI was fine. There was a tank of helium in their garage on South Walnut Street that they had been using to fill Smokey-the-Bear balloons for kids, so they created and inflated their own makeshift weather-balloon-like apparatus with latex gloves. It was a clear night and very still, and when the illuminated craft launched from the Municipal Building it lifted slowly over the north end of the city and wafted leisurely out to the airport. After sightings of their UFO made headlines in the News Journal the next day with 911 calls, City cops, County Sheriffs and State Patrol involvement, the MFD guys knew that if they wanted to keep their jobs they needed to maintain absolute silence about their prank. Because of that, we need to consider the possibility someone just wanted to scare someone shitless for the fun of it. Could it be that the tanker crew performed a practical joke on the helicopter? That sounds like a pretty far fetched idea. It would have been very risky, their chances of getting caught from it would have been very high, and they wouldn't have known how the helicopter would have reacted and if it could have identified them and so on. So highly unlikely. What if most of the helicopter crew was part of it and could have controlled what happened? There was one member whose experience and opinions differed significantly from the rest of the crew, Jezzi, and he just happened to be the new guy in the unit. It was almost as if the rest of the crew tried to control the narrative, Coyne took controls from him, and so on. Could they have performed a practical joke on the new guy, with the help of their friends on a tanker, and it just got way too far? It would have been less risky and easier to control, but all things considered, still seems unlikely. It seems much more probable it was a honest mistake. The tanker crew thought the helicopter was someone else, needing a refuel. There are several possible contributing factors. They may have been on a refueling track. Operation Nickel Grass was ongoing and there was probably various types of cargo that was transferred between bases for further transport (including helicopters). They were close to the home base of a refueling group, who may have also been training there. But surely they should have made some radio contact first? Not necessarily, if they actually had some problems with their radio. Or if there happened to be a refueling training for protocols with radio silence (those are also described in that NATO document). In any case, I think the most likely scenario is that both parties misidentified the other, one for a refueling target, another to an alien craft. From the point of view of the tanker, everything probably seemed to go pretty much by the book, until they finally noticed something's not right while already being on top of the helicopter, and then they took a closer look by utilizing their powerful lights, and took off after noticing their mistake. Did they accidentally ask for fuel? Since the helicopter already seemed to accidentally follow more or less correct procedures, could it be they also did something that indicated refueling needs to the tanker? But you said about being worried. We flew back to Cleveland and almost ran out of gas. Had nine gallons of fuel left in our Huey." We had flown 12 minutes into the 20 minute fuel-warning light. That's what really scared me the most, the fuel problem. I had my shoulder harness locked, and I was praying. I knew it was going to be close. We got clearance from Cleveland, and we came right on in. Did they talk about it on the radio? It would have been a logical location for such talks, closing in on Mansfield Airport and having the option to stop for a refuel. Maybe something was said just at the right moment, which led to a misunderstanding, possibly helped by a malfunctioning radio. About 1804 m.s.t., on November 12, 1974, a United States Air Force (USAF) F-111A 77-055, and a Montana Power Company, Rockwell Turbo Comnder, Model 690A, N40MP, collided in flight near Kingston, Utah. The F-111A was the lead aircraft in a formation of two F-111A's. The formation was attempting a rendezvous with a USAF KC-135 for night air refueling training when the planes collided. The pilot of N40MP, the sole occupant, was killed. The two crewmembers of the F-111A ejected successfully from their aircraft. Both aircraft were destroyed by the collision, the postcollision fire, and impact with the ground. The National Transportation Safety Board determines that the probable cause of this accident was the F-111A pilot's misidentification of the Turbo Comnder as a refueling tanker with which he intended to rendezvous. Contributing to the misidentification was his failure to use prescribed procedures and techniques during rendezvous with a tanker aircraft for refueling. At that time and throughout the rendezvous attempt, Toft 51's wingtip the top and undersides of the fuselage were illuminated and flashed red and white. The engine nacelle floodlights, the underbelly lights, the refueling boom lights, and the boom nozzle lights also were illuminated. The two F-111A's, Sigma 71 and 72, were to join in formation at the ARIP, and then rendezvous with Toft 51 for a refueling exercise on the Coronet Milford Air Refueling Track (AR-316). The aircraft in Sigma flight had their position lights on and steady. Sigma 71's anticollision beacon was off; Sigma 72's anticollision beacon was on. N40MP had only its beacon and position lights illuminated. USN/USMC aircraft may operate green anticollision light(s) identifying aircraft involved in aerial refueling operations. When displayed, these light(s) will be used in conjunction with standard position lights. Note how much variance there is in the use of anti-collision and other lights. Here's some random findings that might reveal new details. 1973 happened to be a year when USAF researched usage of high intensity strobe lights to replace existing anti-collision lights. 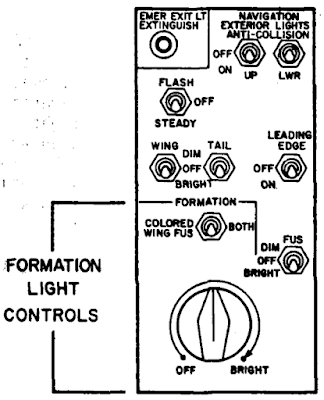 Prototype lights were tested on KC-135A tanker among other planes. There's a chance such research had something to do with the somewhat surprising lack of anti-collision lights, but other possible reasons were already mentioned. There's on particularly interesting retired HC-130P on display in Moody's airpark. It has an interesting history, first as the sole JHC-130P designated test plane in Wright Patterson AFB in 1966, and then again being part of some helicopter refueling test program on the very month the Coyne Incident happened, assuming that information is accurate to a month. Unfortunately information of the exact date(s) and location for that program is missing. It was under Air Force Systems Command (AFSC) control at the time. Some years later it was assigned to 102d Aerospace Rescue & Recovery Squadron (102 ARRS), which acted as the only Air Force rescue organization in the northeastern United States at the time. This case demonstrates a number of common features and mistakes people make that should be checked in other cases as well. It seems like textbook material in many ways. 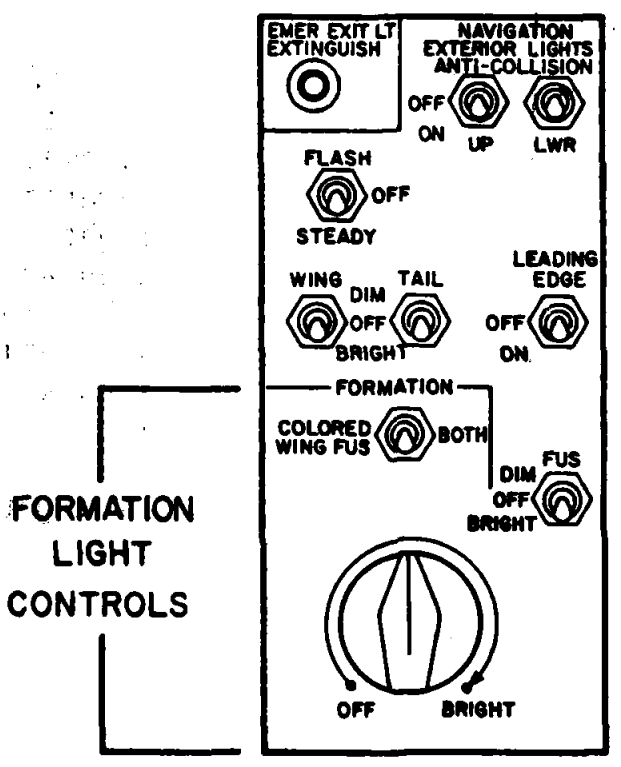 That last one includes a picture of the high-intensity lights of a KC-97. Note that in the Coyne case, those pilot director lights, or sequencing lights in that article, did not seem to play any role. Contact was made with Clinton County Air Force Base, Ohio. The l6oth Air Refueling Group at Clinton County is often engaged in refueling missions along the track "Prop Wash" over central Kentucky. Having some understanding of tankers now, I might take a closer look at those cases and the provided explanations at some point. This case also demonstrates how important it is that such cases are properly reported, investigated and written down, and how every detail can matter and lead the investigation to the right tracks. The Coyne incident has been described as one of the best-documented UFO encounters in U.S. history and that really made all the difference. This case also shows how witness testimonies can be seemingly highly accurate even on some small details, even if they have been affected by earlier news reports and the effects of fallible memories. Many of those witnesses pictured what they saw as some sort of a flying saucer, and thought it was flying sideways in relation to the actual direction, yet they gave very detailed and apparently highly accurate descriptions of how individual lights moved, which might look like insignificant details at first, but were really important for being able to track the actual flight path. There's no indication meteors played any role in this case, but they of course may have in other reports around the same time. While I regard this case to be solved beyond reasonable doubt, it would be nice to have clear evidence of such tanker having been there, and it's identity. That I'm still missing. So what are the chances of finding such confirmation? The letter listed 14 arguments for installing radar at Mansfield-Lahm. Armstrong cited Mansfield's large assigned airspace, the complex mix of air traffic in the area, the large number of near-miss reports and the potential fuel savings of improved traffic flow. After experiencing a near collision with an Air National Guard aircraft during an approach to the airport, Armstrong decided it was time to take action. "As I approached the airport, there was an Air Guard C-130 that wasn't where it was supposed to be, and when I broke out of the clouds I was looking right at it," he remembers. "The incident ticked me off. It was a close call that could have been avoided with radar." With that, Armstrong set out to lobby governmental agencies and Sometime next month, a sophisticated radar system will become fully commissioned at Mansfield-Lahm Airport, transforming an antiquated facility into major-league operation. The installation of the $3.5 million system marks the final step in a victory over federal officials and politicians who said Mansfield didn't meet the established criteria necessary for radar. Ceremony set for airport radar MANSFIELD The newly installed radar equipment at Mansfield-Lahm Airport will be officially commissioned Saturday at 1:30 p.m. during a brief ceremony in front of the Air National Guard Operations Building. The ceremony will feature Roscoe Armstrong, who led the drive to obtain the radar appropriation, and Sen. Howard Metzenbaum, whose office pushed the appropriation through government channels. Stan Rivers, Airways Facilities Division chief of the Federal Aviation Administration in Chicago, will represent the FAA. The 93.5 million project was approved by Congress in late 1979, despite protests from FAA officials who claimed Mansfield-Lahm did not meet official criteria necessary for a radar system. So the closest radar was most likely at Cleveland Hopkins Airport, some 50 miles away. Could that have sufficient range for those altitudes in 1973? The answer turns out to be no. The helicopter was in an area without radar coverage at the time, he was picked up on radar further north by Cleveland. But at no time did anyone pick up the other craft. It seems that plane either never flew close enough to Cleveland, or it may have just been considered irrelevant traffic. Especially since Vollmer seemed to have believed Coyne's erroneous descriptions of its capabilities, which didn't fit to a tanker. So if that Cleveland radar data still exists, there might be a chance it would show that plane sometime before/after the event. Since Mansfield didn't have a radar, they wouldn't even know if someone was flying there with visual flight rules without filing a flight plan (optional for VFR) or e.g. strayed to wrong area due to some navigation error. But if any plane contacted them, surely they should have at least tapes of that? Not necessarily, according to Coyne, who initially managed to make a contact with Mansfield and stated they responded to him with "Go ahead, Army One-five-triple-four", before they lost contact. Yet, when he later asked them, Mansfield couldn't find it on their tapes at all and they told "they had three or four different tapes going, frequencies going." So apparently those tapes are known to be incomplete from the time that event happened. It doesn't need to mean there was some conspiracy or hiding of information, but whatever reason, it looks they had lost some tapes/conversations that should have been recorded. That statement also sounds like they had been busy with coordinating other traffic as well close to those times. That traffic included at least F-100 fighters from Mansfield, of which the last one apparently landed 22:47, less than 10 minutes or so before Mrs. C. initially saw that plane. If those tapes are still archived, they could reveal something interesting, but clearly there's no guarantee of it. Since the crew reported this incident as a near collision, it would seem someone would have to officially investigate it. But it seems it never was. We have taken note of the report together with a sketch from Captain Coyne. But there is nothing further we can do. If the other craft had carried identification we would track it down. But it remains completely and totally unidentified. So apparently they checked that there was no radar data and that's about it. Maybe they would have investigated it if the crew wouldn't have described it as a craft with impossible performance. Did the tanker crew report/record that incident? Seems probable, but it's a different matter in which way and whether that led to anything. From their point of view, it most likely wasn't a near collision but just a mistake of approaching a wrong target that may have been in their refueling area or something. They noticed that when they were close enough, and flew away. That's about it, and maybe it was logged along those lines, basically not giving any reason for further investigation. I really didn't think we would really collide, because the object was obviously completely in control of the situation. Since no actual refueling took place, the tanker probably remained further away than during an actual refueling, so they probably were not even that close from their point of view. Since neither the Army Reserve nor the FAA investigated the incident it's likely nobody even asked for records from wherever that plane originated from. Those might still be available somewhere, but the question is where? Tankers are not that rare and there were multiple military bases and airports nearby. One possibility would be the 160th Air Refueling Group from Columbus. Another might be Wright-Patterson, also relatively close. There probably are some former crew members of that tanker out there, who could tell their story. That would probably be the only possibility to ever find out the full chain of events. Those records, if they even exist, probably wouldn't contain that much detail. I would also like to find out if there was a refueling track there at that time. If you happen to know more about those or have other comments or questions, feel free to use the commenting options below. I'll try to improve this post later as needed based on those. Did you talk to any Army helicopter pilots who would have been trained at the same time as Coyne? Are your assumptions about the operations inside the cockpit based on interviews with Army pilots or are the based on speculations. I would be delighted to provide some insight about helicopters, especially the UH-1 if that would help. What exactly would I need to ask them that isn't already answered by a pilot (Jezzi) who was in that very helicopter when that happened, as quoted above? "I wasn't aware of the climb at all - and 1,000 fpm - it could have been less. It was not that much of a climb, that steep, that much acceleration. But the climbing is something that occurs somewhat easily in a helicopter if you're not paying attention. If you're flying the aircraft and thinking of something else. We were talking rapidly about what was happening. You get excited and you just go like this [demonstrates by raising left arm] and you're climbing. And going from 1,500 to 3,000 feet in two or three minutes is not going to be extraordinary. There are thermals that are so bad that you put your collective down and you're still climbing. I've had it happen to me." For the last 30+ years - this has been my #1 case. However, as a U.S. Navy Aviator the thing bothered me right out the gate was the color of lights on each end of this object. I mean out of all the colors in the spectrum - what are the odds that the two colors happened to be green & red (red is on the left wing of aircraft and green is on the right). Then I know there was also a white light being produced. I never realized that Jezzi never saw detailed structure of the craft that Coyne provided which is interesting. If we are sitting shoulder to shoulder in a helicopter or airplane, it's reasonable to assume that if there is an object right in front of you that both pilots would either see it in detail - or not see it in detail. Kinda strange to have one pilot see it in super HD detail and the other guy says he just saw a bright, white light. Pilots are people too - and make mistakes. The tanker pilots could have realized their blunder, got embarrassed, panicked & just got out of there. I can speak from experience; when flying solo as a civilian, I was still a student pilot flying from the Jersey shore to Trenton, NJ to practice take offs and landings. On final approach, I realized I was lined up on the wrong runway. Once my brain recognize that my blood rushed red hot through all my limbs, chest & face as I realized I just made a major blunder. I was highly embarrassed because I was in communications with ATC the entire time and I figured they were in their tower mocking me & saying "Look at this guy! What in the hell is he doing?!" I panicked, brought the aircraft to full power and just made a random turn to the left just to get the hell out of there. After a few seconds, I composed myself - contacted the tower - and got clearance to align myself with the proper runway. It was a scary moment as I was on approach to the same runway being used for OUTBOUND traffic. It could have ended poorly for myself & someone else. Anyway - who knows - maybe the tanker (if it was a tanker) realized their mistake, got embarrassed & panicked like I did - and just got the heck out of there? "However, as a U.S. Navy Aviator the thing bothered me right out the gate was the color of lights on each end of this object. I mean out of all the colors in the spectrum - what are the odds that the two colors happened to be green & red"
That was one of those important initial hints for me as well to suspect it was a plane. And it's interesting how most of the witnesses actually suspected that too for various reasons, and compared those lights to navigation lights, but then changed their minds as some other aspect seemed out of place for them. Even Coyne, who later draw it as a saucer, contacted Mansfield afterwards to verify it wasn't an F-100 fighter. So he seemed to have still taken that as a possibility. So a plane as the explanation doesn't mean not trusting the witness testimonies, but on the contrary, actually trusting what they themselves initially thought. "I never realized that Jezzi never saw detailed structure of the craft that Coyne provided which is interesting." There seems to be a common tendency to pick and choose only those viewpoints that make a good story, and most only hear those parts. I don't think many accounts even mention those highly relevant comments by Jezzi. I'm not sure all of those original interviews are even freely available anywhere except a few books. Their minds were primed with thoughts of flying saucers, as they had just talked about those before. So when they saw something they couldn't understand, and didn't believe it was a plane even if that was their first thought, it's hardly surprising if their minds began filling in the details they actually couldn't see with something they would have expected. If it was a saucer, it should have a dome, and maybe windows, right. Then the slightest hint of something that resembles that shape would seem to confirm those expectations. That just seems to be how our brains work in general. They try to build a coherent story, even at the cost of accuracy, as that's basically what we need to function. "Pilots are people too - and make mistakes." Exactly. I suppose most of us tend to put certain professionals to pedestal, and forget they are just as suspect to our human limitations, and that being a professional of one area means just that, not that they would have superhuman observational skills for example. I'm sure most of us have done silly mistakes on our own areas of expertise, even if we should have known better. It was also only a few days ago that I had just explained how the parallax effect fools people and should always be taken into account when analyzing cases like these, and then I was driving my car and was fooled by that same effect, once again. We are just very much prone to making certain mistakes, no matter how familiar we are with them. Some are pretty much impossible to avoid because of our physical limitations. "The tanker pilots could have realized their blunder, got embarrassed, panicked & just got out of there." I suspect so too. Would they have reported the incident, or just waited to see if they need to? At least once it made the headlines as an UFO event, they most likely wanted to keep it a secret if possible, like those firemen with their prank. "On final approach, I realized I was lined up on the wrong runway." I remember seeing at least one episode in the Mayday/Air Crash Investigation/Air Disasters TV series where a similar mistake didn't end so well. That series has certainly highlighted often how pilots are people too. There has been some pretty strange pilot errors that have doomed planes. Many of those have been explained by various psychological factors. I believe those investigations provide good lessons on how to investigate UFO cases and possibly inaccurate and conflicting witness statements. This is some very nice work! I hope that further evidence become revealed. Well this debunking story follows a similar line as that of Tim Printy and his analysis of the Phoenix Lights incident. In both cases they suggest that is was an airplane(s) that fooled the witnesses into thinking that something extraordinary was happening. However neither Parabunk or Mr. Printy give any evidence from flight crews, ground crews, radar, flight plans or any such relevant data that pertains to the aircraft(s) answer. In other words these aircraft might as well been ghost planes. Both are just making conjectures and picking an choosing any bit of witness testimony that looks to support their debunking analysis. In the Coyne case there have already been checks with Mansfield and the FAA about other aircraft in the area of question and answer was negative. Missing planes seem to be a real problem in both these cases but does not seem to phase the debunking algorithm. The incident happened in an area without radar coverage and even today military planes can and do fly in that area on those altitudes with visual flight rules without flight plans and without atc clearance. So it actually could have been a "ghost plane" as far as Mansfield air traffic control is concerned. They wouldn't necessarily know anything about it. But then again, at the moment we don't know if that was the case. We don't know if they had any records and whether those records still exist. Coyne stated he asked Mansfield for "high performance aircraft", so he was asking the wrong question. So even if there are no known records for that plane, there also aren't any known records indicating it wouldn't have been there. And mind you, there are no records of anything at all flying there, so the case itself has never had the sort of supporting evidence that is now being demanded for the explanation. Sorry about the delays on making your comments visible. There seems to be some issues with Blogger as it hasn't shown those comments in the moderation queue earlier. I just saw them for the first time. Thank you for pointing out that problem. I suppose you meant that picture of a KC-135 Stratotanker refueling an F-15E? It also loaded very slowly on my browser and the reason was that I had embedded it directly from DoD servers, and they seemed to have some issue. I copied that image now to the blog. Please let me know if there are still issues with pictures. I gotta bookmark this site it seems handy very useful.